3.1 Launch application from Plex Add-In tool bar. 4.1 Considering Multiple Objects Found or Usage. Kudos to Plex_Upgrade_Wizard which this unashamedly borrows/steals/copies but adds AS400 query. DLL/AS400 Object names that Exist in your CA Plex models and are used by a function but the function is Not Generatable under the current config. Finally a Plex list can be created which represents all the DLL/AS400 Object in the query directory/library found in your local model. Please view current rules for what objects are considered "Object Generatable?" Launch application from Plex Add-In tool bar. If you are unable to see the Add-In toolbar from View, Toolbars… menu option choose Show toolbar. In order for the tool to get a list of objects from the AS400 it calls OBAS400\Get objects.List attributes.Get sequential. So you must have pgm OYeF built and in your library list. Secondly StellaImpObjs.INI must have the appropriate Remote settings added. 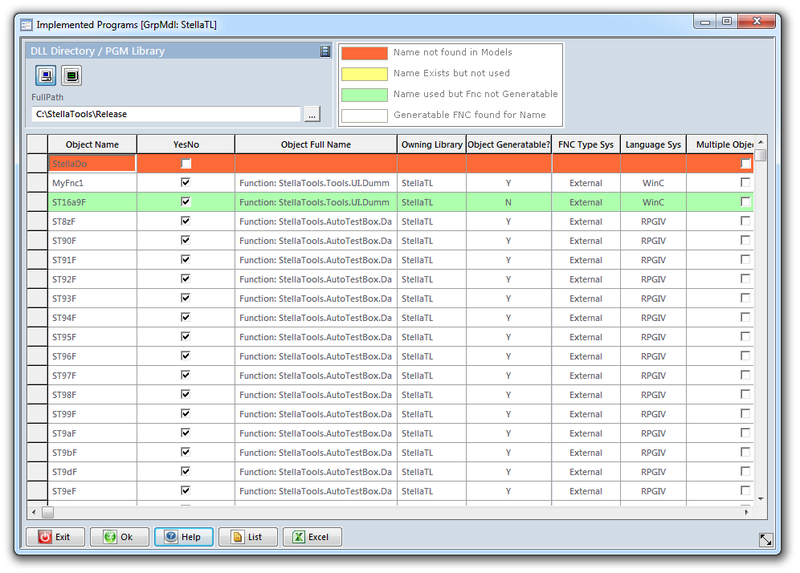 FullPath Promptable Edit box for the directory containing the DLL you want to interrogate. Object type Combo is defaulted to *PGM. 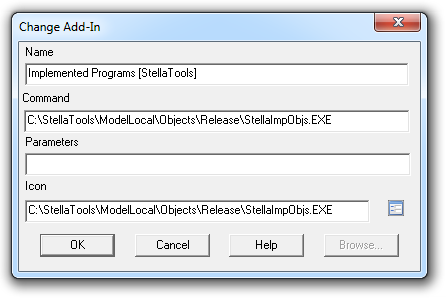 1 - PGM/DLL name from the source library/directory could not be found in the current local model as a Name object. 2 - PGM/DLL name was found in the local model and is being used as a file name for a function object But the function is not generatable under the current local model configuration. 3- PGM/DLL name was found in the local model but is not being used as a file name for a function object. 4 - PGM/DLL name was found in the local mode and is being used by a generatable function under the current local model configuration. 5 - You can multi select the Type 4 grid rows to create a Plex list. You will be prompted with an enquiry message detailing the List name to be created. Only Type 4 rows (PGM/DLL name was found in the local model and is being used by a generatable function under the current local model configuration.) can be added to a List. Considering Multiple Objects Found or Usage. 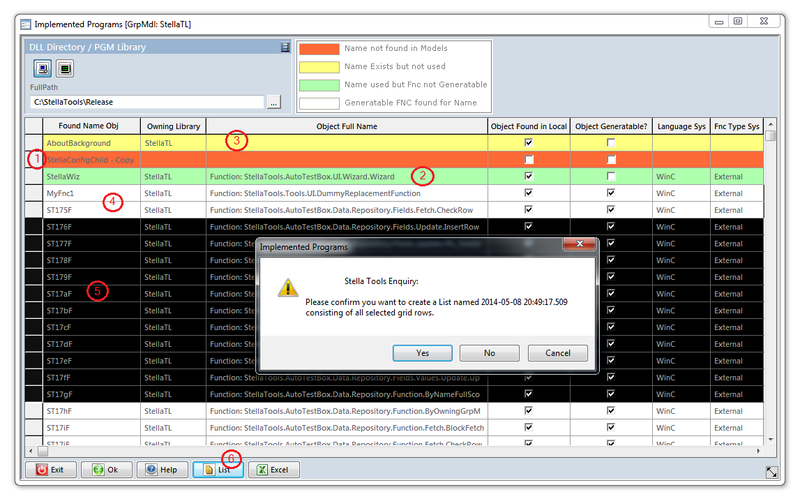 When PGM/DLL name was found in the local model multiple times as the same object name defined in multiple models then the owning library name is post fixed enclosed in square brackets and Multiple Objects Found column check box is checked to allow easier sorting. 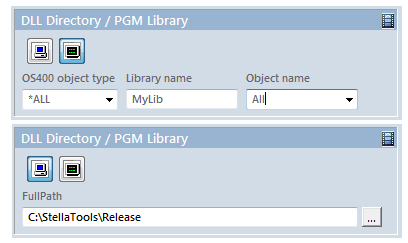 It is possible for the 'same object name' to be used as a 'file name to a function' multiple times if an object name is created in a library then used in a host model, followed by the owning library then using the object name but this is an uncommon event but was had been causing a bug, so 'Multiple Usage of Object' column is present to cater for this infrequent occurrence.